Emaline Wallace has always been a question mark. She was living with Nancy Sowell Furr (Isham Wallace and Enoch Wallace's mother-in-law) in 1850 suggesting that she was a possible daughter of Isham or Enoch. My grandfather, Mallie Wallace, remembers Emaline's son, John Davis, coming to visit his father and grandfather. His grandfather was Emsley, son of Isham, who died in 1918. But my grandfather tells a story that was told to him by his grandfather, where Lock and Emaline Davis were sharecroppers for Isham. He says that he was told that while Lock & Emaline worked on Isham's land, that Emaline had John and Alexander. But the children's father was not Lock Davis it was Isham. He said that Isham and Emaline were not related. I am more inclined to believe that Isham was the father of Emeline, but in 1866 in the Moore County court case Emaline Davis vs. Isham Wallace, it was ordered by the court that John & Alexander Davis be remanded to the custody of Isham Wallace until the next county court session. This together with the fact that John and Alexander were living with Isham in 1870 is confusing. Another interesting fact is that when Isham Wallace died there was a long drawn out court case concerning his estate and who should get what. All of his children, including the ones that were deceased were listed. The children that were deceased were represented by their spouses who were still living or by the guardians of their children. Emaline, John, or Alexander were nowhere to be found in these proceedings. 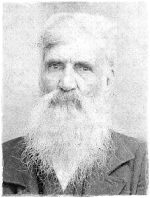 Even John M. Wallace, the youngest son who had moved to Perry County, Arkansas was represented. That would leave you to believe that there was not a connection between them. Also, in the 1880 census John is still living with Isham and Nancy. But his relationship to the head of the household is listed as servant, not son or grandson. But in the 1890's John Davis moved to Rockingham, Richmond County with Missouri Wallace (Sampson Delaney's widow), Candace Wallace (John M's ex-wife), and their respective families. There is some kind of a connection between John Davis and the Wallaces but I am not exactly sure what it is. The court ordered that John Davis & Alexander Davis be remanded to the custody of Isham Wallace until the next county court and that he bring them to said court on Monday.